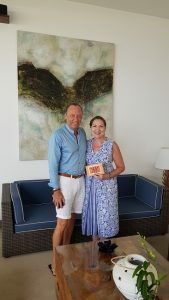 Mobile Travel Agents Advisor Sue Basedow with Old Harrovian George Cooper, the owner of two Kahanda Kanda (KK) boutique properties in Galle in southern Sri Lanka. Sue met the Old Harrovian and internationally-renowned interior designer while visiting Sri Lanka as part of a Unique Tourism Collection study tour showcasing boutique luxury properties in Colombo and Galle. Hotel inspections aside, Sue’s busy program also allowed time to sample many of the activities guests staying at the various properties can enjoy. These range from cookery demonstrations yoga classes, boating and walking tours.